Kage Baker was an assiduous researcher. She found a lot of her favourite stuff while hunting for something else. Sometimes she saved it for a new story; sometimes it became an additional tint or texture in the tale already to hand. Sometimes it took over, and changed the entire thrust of the story. That was the case with “Standing In His Light”, which started with an idea about Leeuwenhoek and strange lenses and ended up with Vermeer and a camera obscura. Leeuwenhoek was reduced to a cameo; along the way, Kage captured the pain and glory of being a painter’s daughter. And she was still left with Roman photographs on geranium leaves, which never did work its way into a story … but might someday. That’s how my present compulsive Australian exploration began. I was reading through my daily round of semi-professional news sources: aggregator sites like fark.com wherein occasional gems glitter through the tide of nonsense, and articles from more staid and respectable folks like the New York Times and Scientific American. And I found a strange and exciting description of researchers actually verifying that many of the oral traditions of the Australian Aborigines hold up to geographical and meteorological fact over the LAST 10,000 YEARS. TEN THOUSAND YEARS, Dear Readers. That gives them the oldest continuous culture on Earth. This hit me right between the eyes, symbolically; so physically strong that I could feel my pupils dilating with sudden rapt attention. All those little muscles in my eyes just sat right up or contracted or stretched or whatever the hell they do when something rivets a mammal’s attention. A naked man, a crying baby, a pound of chocolate – the reactions to those were as nothing to the sheer intellectual arousal of that idea. I’ve been swooping all over the current map of Australia today, and all the other maps of it I can find from the last 50,000 years. I must share with you, Dear Readers: there seems to have been no time in its entire solo career where Australia has not been the Queen of Weird. They don’t call it Oz for nothing – in fact, Baum’s corn-fed imagination pales in comparison to the real Terra Australis. The Southern Earth is as strange as snakes’ suspenders, and it always has been. This is a clam. And it’s been turned to opal. Australia does that sort of thing. The story will resume tomorrow, when I’ve assimilated, and collated, and cross-referenced, and interwoven more fact with more fantasy. I’ll be hoping for opals. This entry was posted in Uncategorized and tagged Australia, Google Earth, kage baker, Leeuwenhoek. Bookmark the permalink. 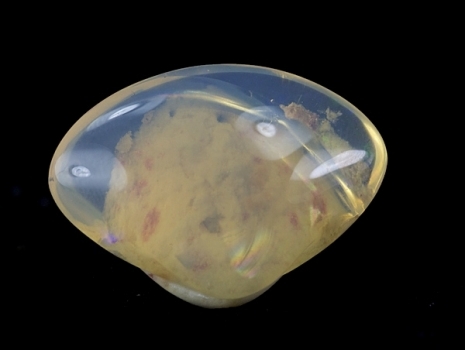 An opal, in my opinion, while very pretty, ranks slightly below a platypus. I might be biased because we’ve been marathon watching Phineas and Ferb, though. It’s hard to resist Agent P, I admit. And in most all cases, I too prefer playtpussies (platypi?) to opals. And I have a long-standing emotional relationship with clams … it’s the tranformation that wows me. Now, if someone found a playpus fossil changed to opal … jackpot! It’s not the opal, it’s the fact that that opal used to be a clam shell. Now that’s easily as weird as a platypus, to my mind. By the way, Kate, I don’t know if you like Bill Bryson (I think he’s mostly terrific) you might want to spend some time in Australia with him. http://www.amazon.com/Down-Under-Bill-Bryson-ebook/dp/B000Q9ISSQ. Maggie – took a look at Mr. Bryson and was instantly hooked. Not only is he entertaining, I can use his references to track down the primary sources and original reports. Thank you so much!